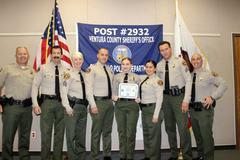 In addition, the Camarillo Explorers were happy to have Sheriff Elect Bill Ayub present. Along with Camarillo Chief of Police Commander Dave Murray and Camarillo Police Captain Jeremy Paris present to join in their commendations and family time. The Explorer Program is designed to challenge and strengthen youth in today’s culture. Explorers are pushed mentally, physically, and morally to show that they can create change and do anything they set their minds to. If you or anyone you know is interested in the explorer program, please contact Senior Deputy Shawn Holzberger at shawn.holzberger@ventura.org or visit our website at www.vcsd.org/explorers.